Sweet Garlic is a fast-growing, bulbous plant that reaches a height of 2 ft. The leaves are long, narrow, strap-like, slightly fleshy and smell strongly of garlic when bruised. They grow from fat, tuberous roots which spread to form clumps of plants. 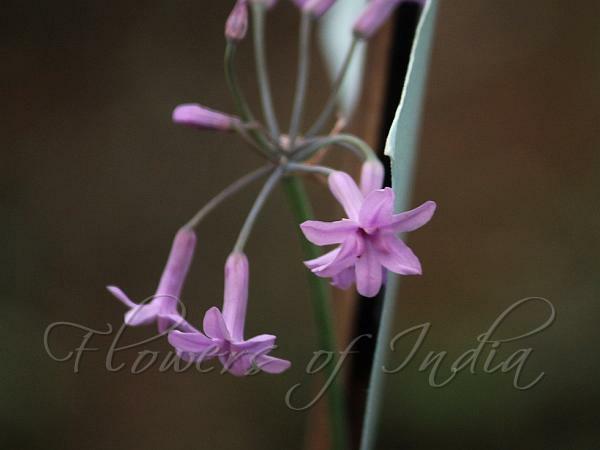 The pinkish-mauve tubular flowers, clustered into umbels of up to 20 flowers, are held above the leaves on a tall flower stalk, and have a long flowering period. They too smell of garlic when picked. The fruit, triangular capsules, are grouped into a head, and when ripe they split to release the flattened, hard black seeds. The Zulus use the leaves and flowers as spinach and as a hot, peppery seasoning with meat and potatoes. They also use the bulb to make an aphrodisiac medicine. Wild garlic is a very good snake repellent and for this reason the Zulus plant it around their homes. Sweet Garlic is native to South Africa, grown as a garden plant elsewhere. Flowering: January-April. Medicinal uses: The fresh bulbs are boiled in water and the decoctions are taken orally to clear up coughs and colds. The bulb has been used as a remedy for pulmonary tuberculosis and to destroy intestinal worms. Wild garlic may prove to have the same or similar antibacterial and antifungal activities as has been scientifically verified for real garlic. The leaves are used to treat cancer of the oesophagus. Identification credit: Hussain Barbhuiya Photographed in cultivation in Mumbai.